Blanche Meyers Lambert Lincoln was a U.S. Senator from Arkansas from 1999 to 2011. 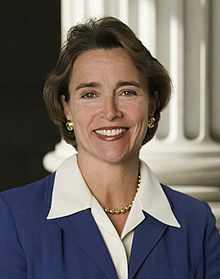 Lincoln, a member of the Democratic Party, was first elected to the Senate in 1998; she was the first woman elected to the Senate from Arkansas since Hattie Caraway in 1932 and, at age 38, was the youngest woman ever elected to the Senate. She previously served in the U.S. House of Representatives, representing Arkansas's 1st congressional district from 1993 to 1997. Blanche Meyers Lambert Lincoln (born September 30, 1960) was a U.S. Senator from Arkansas from 1999 to 2011. Lincoln, a member of the Democratic Party, was first elected to the Senate in 1998; she was the first woman elected to the Senate from Arkansas since Hattie Caraway in 1932 and, at age 38, was the youngest woman ever elected to the Senate. She previously served in the U.S. House of Representatives, representing Arkansas's 1st congressional district from 1993 to 1997. Lincoln was the first woman and the first Arkansan to serve as chair of the U.S. Senate Committee on Agriculture, Nutrition and Forestry. She also served as the Chair of Rural Outreach for the Senate Democratic Caucus. In 2010 she ran for a third term, but lost by a 58%–37% margin to Rep. John Boozman, whose brother, Fay Boozman, she defeated in Arkansas's 1998 Senate election. Sen. Blanche Lincoln speaks to supporters after making it to the runoff in the Arkansas Democratic Senate primary. Lt. Gov. Bill Halter (D-Ark.) spoke with Nancy Cores about why he's running for Blanche Lincoln's Senate seat in the state's upcoming primary. Plus; Gov.